Elegant Popcorn Bars with Gourmet Hand Crafted Popcorn to Celebrate Any Occasion. How Much Popcorn Do I Need? Red, White and Whew it is Hot! It is that time of year. The 4th of July will be here very soon. Party planning and getting friends together for an event like this is what summer was made for. Food, family, friends, and fireworks. Popcorn can make a perfect snack for your Pop on the 4th party. 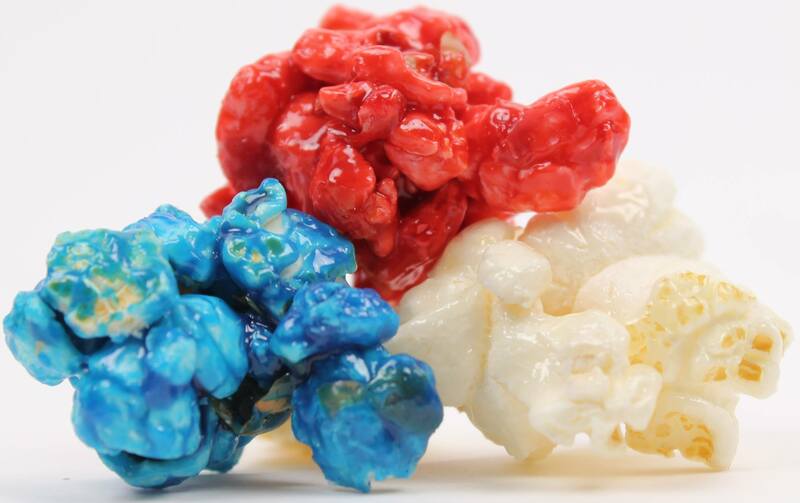 Choose from flavors like Apple Pie, Key Lime Pie, Strawberry Shortcake, Firecracker, Patriot Pop (red, white and blue sugar corn), and good old fashioned Original Kettle Corn. Serve your popcorn in the afternoon hours when it is not so hot outside. Place is glass jars for a very American look. Serve with cold Beer or Sweet Ice Tea. What could be better to snack on while watching the fireworks go POP! Happy 4th to you all! KernelEncore on Champagne & Strawberries – Stunning, Elegant, and Yummy! KernelEncore on Kernel Encore’s Champagne Sparkle is Featured in Star Magazine.